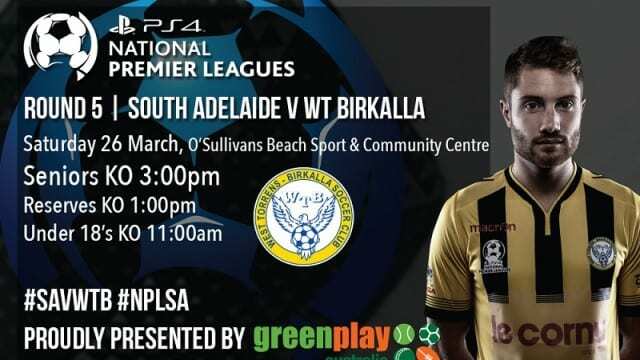 PlayStation 4 National Premier League South Australia, Round 5 South Adelaide v WT Birkalla. West Torrens Birkalla head south this week in Round Five of the PlayStation 4 National Premier League South Australia. After last week’s 3-0 drubbing of Olympic away, Birkalla will be after their second win on the trot over South Adelaide, a team with a fortress of a home ground. A win, this week, is an absolute must for Birkalla, who are surrounded by four other teams – Adelaide Blue Eagles, West Adelaide, Adelaide City, Adelaide United –also on seven points. When considering the tight top half of the league – last season – he says, it places a great deal of importance on maintaining consistency, in every game this year. “Not just this game, but every game is important … we need to have the same attitude in every single game. They will be without their zealous dangerman – Paul Radice – this week, after the young striker was shown a straight red against Adelaide Olympic, last week. However, the squad supposedly has enough depth to fill Radice’s place, and returning striker, Watson, hopes he can be the one to do so, if given the chance. Watson, 24, says he is eager to make his season debut after a lengthy groin injury, which kept him sidelined for the first four rounds, this year. “I tore my groin in training, two weeks before the season started. “I’ve been with the reserves the last two weeks, and I’ve played full 90’s. South – regardless of their position on the table – can be very unpredictable, especially at home. Birkalla know this, and they are well aware that South – in the past – have beaten some high quality sides, so they have prepared for this week’s game with a degree of caution. “If you looked at them around this time last year, they were in a similar position. “Towards the end of last year, they gelled well and went unbeaten, beating teams like West Adelaide, and Campbeltown, so you can’t judge a team on where the are in the league.